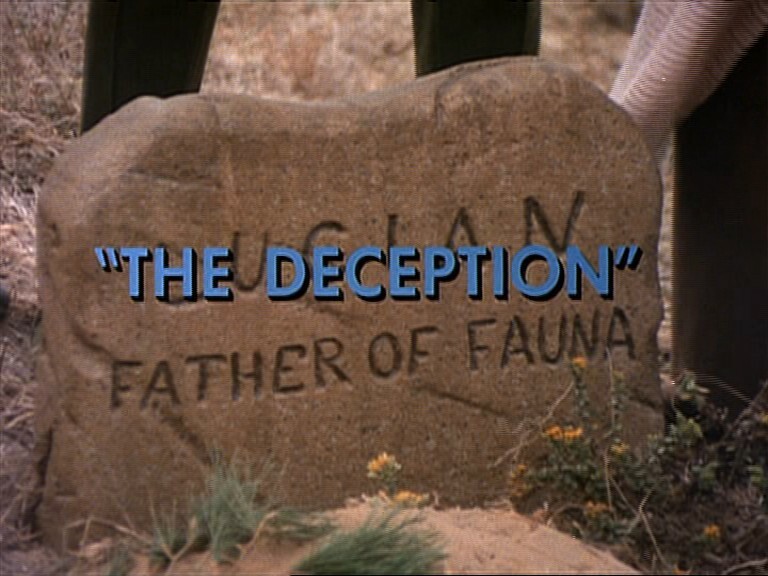 In “The Deception,” Galen (Roddy McDowall), Alan Virdon (Ron Harper) and Peter Burke (James Naughton) unexpectedly become enmeshed in a local racial dispute when the death of an ape at human hands results in vigilante acts by angry apes. 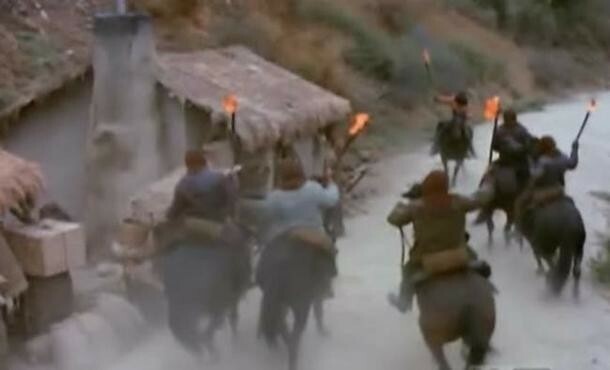 These vigilante apes ride on horses, wear hoods, and torch farms belonging to humans. They are also willing to commit murder to assert their supremacy (and their hatred for humans). 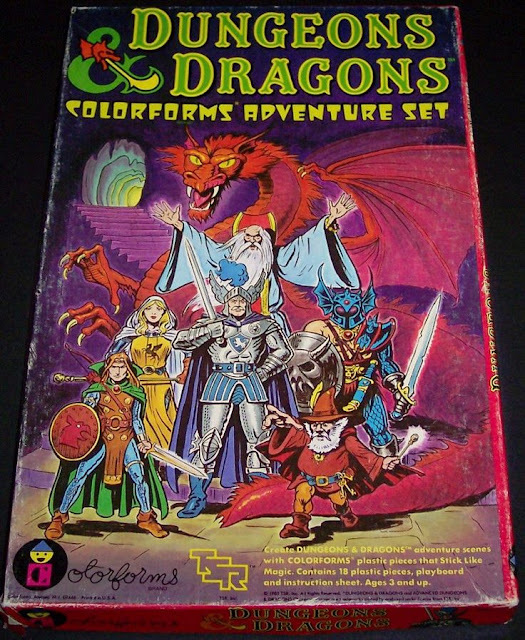 These are the monsters known as the Dragoons. The fugitives meet with the daughter, Fauna (Jane Acton), of the slain ape, Lucian, and learn that she is blind. She mistakes Burke for an ape and falls in love with him, an act which precipitates an unfortunate deception on the part of the heroic trio. Meanwhile, Galen pretends to be a human-hating ape so as to infiltrate “the dragoons,” the ape vigilante cult. His mission fails, which means that Alan and Pete have no choice but to seek the help of local ape authorities. Although, again, there is no real mythology presented in this episode of Planet of the Apes (1974), “The Deception” is nonetheless one of the strongest episodes of the short-lived series. There are two reasons why this is the case. First, the episode focuses on an unfortunate mistake or accident. Fauna, an ape, falls in love with Burke, a human, and he can’t correct the situation without putting himself and his friends in danger. In other words, Burke must go on, with Galen’s help, pretending to be an ape, so as not to be discovered. Burke is acutely aware that this deception is hurtful to Fauna. Galen actually gets angry with Burke about the situation, though there is nothing else to be done. I could write that this is a very “human” predicament, but that may not be an appropriate description given the circumstances. The bottom line is that this episode allows Galen to show anger and irritation when he perceives that a gentle, kind ape is mistreated. And it also permits Burke to express regret over his own actions. Too often, the main characters on this series seem infallible or are grappling only with simple-minded action plot-lines. Here, the cost of the fugitives’ deception is very personal. Secondly, “The Deception” works beautifully on an allegorical or metaphorical level. We recognize them, in our world, as the Ku Klux Klan. The Klan (and the Dragoons) believe first and foremost in their own superiority, and secondly, that their superiority gives them the right to circumvent the law to achieve their ends. The Dragoons, and their real life model, are but cowards who hide in hoods so they can commit their crimes without reprisals from law enforcement, and society at large. It is rewarding that Planet of the Apes would tackle the problem of race-based hate groups in America, in 1974, and the comparison to our world is powerful, and impossible to miss. The presentation of the “Dragoons” is similarly a reminder that not everybody accepts diversity, or people of different beliefs. Some people respond to evolving social order with terrible violence. Some people seek to destroy that which is different, or which they don't understand. 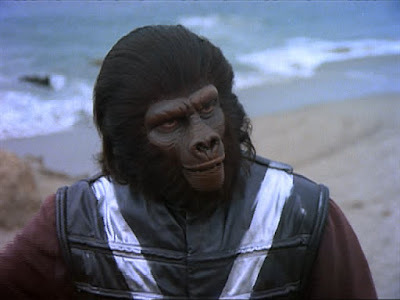 Notably, the gorilla sheriff, Perdix (Baynes Barron) in this episode is treated in an even-handed manner, which is quite a surprise given the franchise. He may be a gorilla, but nonetheless he sees the value in the rule of law, and does not succumb to the hatred that other apes -- including a chimpanzee -- do, in this situation. Gorillas are almost universally treated as one-note, or two-dimensional characters in this series; they are dumb, militaristic brutes. This episode stands out as a notable and remarkable exception. Fauna is also a terrific character, and the fact that she is blind is not a gimmick. Instead, it is a significant reminder that we can't always "see" the truth, even when it is right in front of us. Fauna hates humans because she believed they killed her father. She is unaware that her own kind -- apes -- are responsible for this crime. “The Deception” is a powerful, well-constructed episode because it isn’t just a series of captures and rescues, but a story about people who make mistakes, and about dark tendencies that we recognize from our own world, even today. Spectacular review! Your POTA reviews inspired me to watch the premiere episode of the PLANET OF THE APES animated series and I was shocked to see that it involved characters from the movies, including Nova and Brent!